This modern riverside home features beautiful interiors with Scandinavian influence and tons of natural light, ready to welcome you to one of Bath’s coolest neighbourhoods right next to the River Avon. The home has been recently redecorated in a contemporary Scandinavian style that works well with the open architecture of the house. All the beds have comfortable mattresses and each bed can sleep two guests. The 3 bedrooms come with double beds, comfortably sleeping 6. All bedrooms have beautiful large windows. The large and bright kitchen is fully equipped and offers a great space for communal cooking and gathering. It opens up to to the homes modern dining room as well as the living room area. The entire open living area offers a great place to spend time with your family or friends. The living room has large sofas, a mounted TV, perfect for cosy evenings. It also features several bottom-length and roof windows which make this the most special place in the home. There is also a sofa bed sleeping one more guest. The house is equipped with high-speed WiFi and plenty of space to get work done should you need it. Two bathrooms come with showers and the third one features a bathtub. Two bathrooms are also en suite for guest added convenience. There are also a washer and an iron should you want to use them. There’s secure parking spaces close by should you need to park your car. The property is in a locked gated community and is very secure. Please reach out through this listing if you have any questions, as I am always on call and available to my guests if needed. 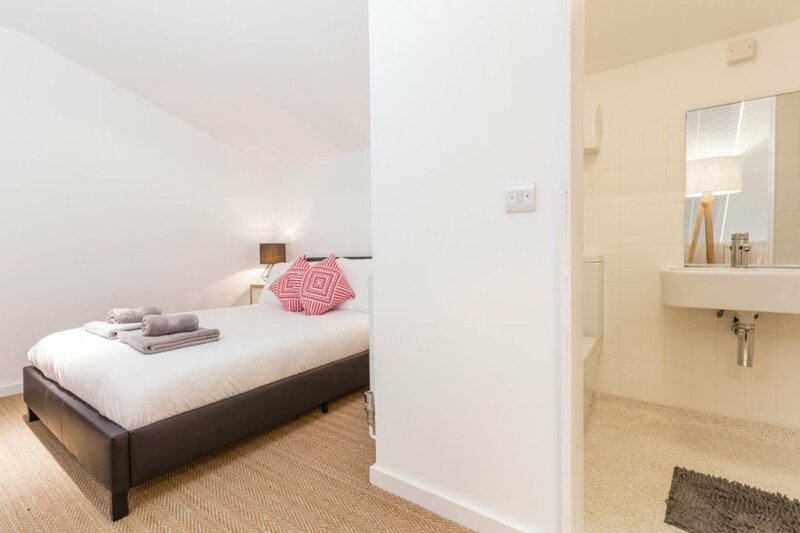 The home is located in a beautiful neighbourhood in Bath overlooking the River Avon and is walking distance from many of the town's attractions such as the Roman Baths, the Jane Austen Centre, the Abby, and the Victoria Art Gallery. The area around the house has a lot of cute local shops, culture and many great restaurants and coffee shops. The neighbourhood itself is quiet and safe and has a lot of green spaces and parks. The home profits from being in such a great location. Since you’re so close to the river and other attractions, this place is perfect for someone who wants to explore beautiful Bath by foot. The surrounding areas are easy to get to and around. There are affordable Taxis and Uber as well as public transport available should you not want to walk. This home is located right in the middle of the city, so it’s perfect if you want to enjoy the lively city centre. The home can be a little tricky to find but the check-in guide has a detailed explanation of how to find it. There’s also a phone number to call at any time if you’ll need help locating it. The home is spread across multiple levels and guests who have difficulties with stairs may find it hard to access the whole home. The home is surrounded by the sights, sounds, and smells of the cafes, restaurants and bars around it, perfect for those who want exciting things to do right on their doorstep. The home has lots of natural light and is beautifully bright throughout. Travel cots can be provided upon request but guests will have to bring their own linens.